MidAtlantic DayTrips: Eight Winter Day Trips Not to Miss in 2018! Just because it's cold outside doesn't you should sit at home waiting for warmer weather! Here are eight winter day trips you should definitely try out this year!! Winter is a great time to appreciate the wonderful natural environment of a beach, without the hordes of sun worshipers. Shaped by storm, wind, and tides, Island Beach State Park is a narrow barrier island stretching for 10 miles between the restless Atlantic Ocean and the historic Barnegat Bay. Despite being a relatively short drive from some of the the most densely populated areas on the East Coast, here you can glimpse the pristine land that native Americans and early European explorers found along the New Jersey coast so long ago. Why should you go there? In addition to the beautiful, wild, ocean/beach/dune scenery, were the foxes. With a mixture of luck and patience, you will see many foxes. In fact, the park is rather known for its red foxes! For more information, click here. Another great winter beach day trip destination, when the ocean-dipping crowds depart, Assateague Island really comes alive for me. Cooler weather means pleasant walks along the island trails, and of course, no bugs! Assateague Island is a 37-mile long barrier island located off the eastern coast Maryland and Virginia. The Maryland section contains the majority of Assateague Island National Seashore and Assateague State Park. The Virginia section contains Chincoteague National Wildlife Refuge and a small part of the national seashore. It is best known for its herds of feral horses and pristine beaches. The island also offers numerous marshes, bays, and coves. In the winter, the horses are very visible and interested in the island's visitors, and they're likely to greet you as you enter the island. They will also try to prank you: one pony stood with his (her??) muzzle against our car, daring us to drive away. Of course we stayed put, not wishing to hurt him/her until the equine was good and ready to move on its own. For more information, click here. Henry C Mercer built two concrete castles -- both amazing in their own right. Fonthill Castle has more than 44 rooms, 18 fireplaces, 32 staircases, and more than 200 windows of various sizes and shapes. Mercer believed in recycling and reusing, so if he encountered at a sale an old window from an old house or church or other public building that he thought would fit his castle, he bought it and inserted it into his design. His castle is organic, in that it seemed to have been designed from the inside out. The ceilings are sloped and rounded (all with tiles inserted), and few rooms are square or rectangular. Why go in the winter? Fonthill Castle is mostly heated, sort of, but you'll want a jacket for a few rooms that were quite cold, and the house tour leads you outside to one of the terraces. I can imagine it gets miserable in there in the hottest weather. For more information, click here. Any art museum will do, but one of my favorites is the excellent, little-known gem of an art museum in Hagerstown, MD: the Museum of Fine Arts. The Museum’s permanent collection encompasses more than 6,500 objects, including paintings, prints, drawings, sculptures, and decorative arts. The collection includes strengths in American art, 19th century European, international collections that reflect the founders’ cosmopolitan worldview, and collections of world cultures. Why you need to go: the Singer Memorial Gallery, which was established in 1949 by the Museum’s founder, Hagerstown native Anna Brugh Singer (1873-1962), as a tribute to her husband, artist William Henry Singer, Jr. (1868 – 1943). The diverse art collection they amassed, and of which over a hundred works were donated to the Museum, conveys the story of their lives as American expatriates in Norway and art collectors, while presenting compelling and significant works reflecting American, Dutch, and French trends of the late nineteenth-century. For more information, click here. For other favorite art museums, click here for the Andy Warhol Museum in Pittsburgh, and here, for the American Visionary Art Museum in Baltimore. Anything to do with dogs, or wolves, would be an automatic favorite!! If you're heading to the Poconos -- or any other winter wonderland -- then it makes sense to explore the quintessential winter sport, dog sledding! 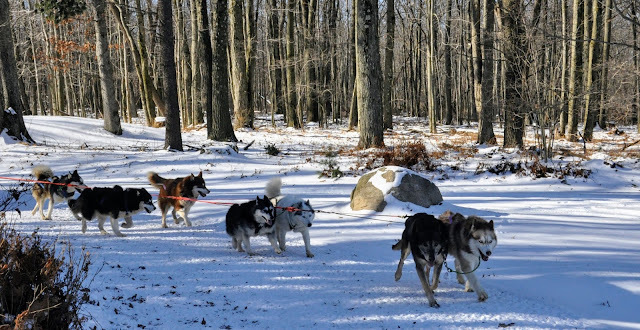 In the Poconos, Arctic Paws Dog Sledding Tours offers either sledding or training runs -- depending on the weather of course -- for guests to enjoy. Either way, you can find yourself surrounded with fluffy, lovable, quirky huskies! You can find other dog sledding tours elsewhere. Because there wasn't enough snow on the ground, we were invited to go on a training run, during which we rode an ATV pulled by the huskies through one of Pocono Manor's several golf courses. The scenery was lovely and it was fun to watch the huskies do what they love to do most -- run in the snow. For more information, click here. Since its founding 30 plus years ago, the Wolf Sanctuary of PA has provided wolves and wolf hybrids a way out of institutionalized lives and deaths. The Sanctuary offers public tours on weekends as both fundraising and public relations for the wolves, and can accommodate about 200 visitors/day. Why go in the winter? Because you can see further into the individual pens, which during the summer are often obscured by leaves and brush. Recommend signing up for one of the Howl with the Wolves bonfires, usually on the weekend closest to the full moon. Hearing the wolves spontaneously howl is one of the most amazing experiences I've ever enjoyed. For more information, click here. What better way to enjoy winter wonderland scenery and some rather dramatic views and challenge your driving skills than by taking an ATV (in our case, a utility vehicle) in the snow. We went first down a mountain, then back up, then through a stream, then up over a ridge and traveled along it, finally to descend the other side. Along the way it felt as if we went up to the top of the world, and saw lovely views accordingly. There were minor thrills as our tires spun out on a patch of snow packed into ice and going up the inclines, but that accentuated the overall fun of the ride, which took us an estimated 10 miles and 1 hour. If you enjoyed this post, go to this page to keep exploring all the other interesting places the Blog has visited! And share the Blog with others!